Single code audit does not guarantee its security. We recommend proceeding with several independent audits and a public bug bounty program to ensure smart contract security. Security audit should not be regarded as investment advice. The Akropolis team asked us to audit their token sale contracts. The code was located in the hidden GitHub repository. 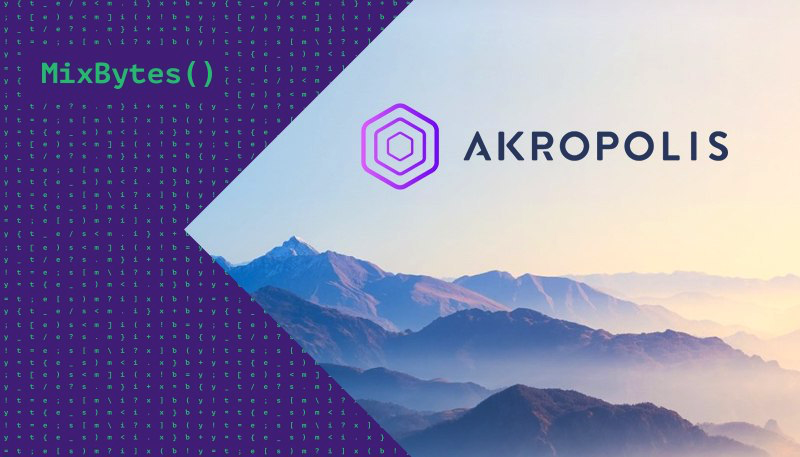 The primary scope of the audit is smart contracts at https://github.com/akropolisio/AkropolisToken/tree/3ad8eaa6f2849dceb125c8c614d5d61e90d465a2/contracts. The scope is limited to contracts which are used in migrations at https://github.com/akropolisio/AkropolisToken/tree/3ad8eaa6f2849dceb125c8c614d5d61e90d465a2/migrations. Audited commit is 3ad8eaa6f2849dceb125c8c614d5d61e90d465a2. CRITICAL: Bugs that enable theft of ether/tokens, lock access to funds without possibility to restore it, or lead to any other loss of ether/tokens to be transferred to any party (for example, dividends). MAJOR: Bugs that can trigger a contract failure, with further recovery only possible through manual modification of the contract state or contract replacement altogether. WARNINGS: Bugs that can break the intended contract logic or enable a DoS attack on the contract. COMMENTS: All other issues and recommendations. The audit was performed with triple redundancy by three auditors. Collision of storage layouts of TokenProxy and AkropolisToken. As can be shown, a collision is almost completely avoided because paused and locked flags were packed by the solidity compiler and don’t collide with other fields, as well as the slot for whitelist not being used (because mappings are implemented in such way). But there is collision of bool whitelisted and decimals fields. A simple solution is to use “unique” slot locations for each field (except shared base contract fields) derived via keccak256, for example: https://github.com/poanetwork/poa-network-consensus-contracts/blob/0c175cb98dac52201342f4e5e617f89a184dd467/contracts/KeysManager.sol#L185. In this case we also recommend that the contract name into hash function invocation is included, and the use of abi.encode in place of abi.encodePacked, like this: unitStorage[keccak256(abi.encode(“TokenProxy”,”decimals”))] = decimals. A variable is named inversely to its value, meaning “unlocked” is to be expected in this case. Normally variable names are not a critical issue, but in this case as a result of code modifications during maintenance, it may lead to logic reversal. The result of a function call from the base contract is ignored and the result is always returned as false. Any users of the “AkropolisToken” contract (including other smart-contracts) who check the result of the function, will consider calls to have failed. Most likely, the following piece of code is missing return super.approve(...). The result of a function call from the base contract is ignored and the result is always returned as false. Any users of the “AkropolisToken” contract (including other smart-contracts) who check the result of the function will consider calls to have failed. Most likely, the following piece of code is missing return super.transfer(...). The result of a function call from the base contract is ignored and the result is always returned as false. Any users of the “AkropolisToken” contract (including other smart-contracts) who check the result of the function, will consider calls to have failed. It appears that the following piece of code is missing return super.transferFrom(...). The approve function is not disabled by default, contrary to what the comment claims. Moreover, there is a contradiction with this commentary — the approve function is not blocked by a designated mechanism or a flag. It’s allowed by the common pause mechanism, also implemented for the following functions increaseApproval, decreaseApproval, transfer, transferFrom. Modifier whenUnlocked is removed in the following commit 434aab. We recommend declaring UPGRADE_DELAY as constant. This will prevent unintended modifications and save gas. We recommend updating the compiler to version 0.5 or newer, as it includes error fixes and a lot of smaller tweaks and checks, facilitating safe code writing. The use of proxy-contracts mechanism in Solidity and EVM has its risks. We detected and suggested a fix to a problem that arose in connection with it. A number of minor issues were also addressed. The rest of the code is well-structured and written perfectly. The version https://github.com/akropolisio/AkropolisToken/tree/c52f938296e37716432265655528175b748df174 (development branch) doesn’t have any vulnerabilities or weak spots according to our analysis. The audit was performed by MixBytes team. In case you need a security audit for your project please submit an application at the official website or via Telegram.